Antonio Citterio was born in Meda in 1950 and today lives and works in Milan. He graduated in architecture at the Politecnico of Milan and from 1972 he has worked for leading manufacturers Vitra, Flexform, Flos, Iittala, Kartell and Arclinea, including his ongoing role as art director for both the B&B Italia and Maxalto brands and the architect behind the group's retail showrooms around the world. 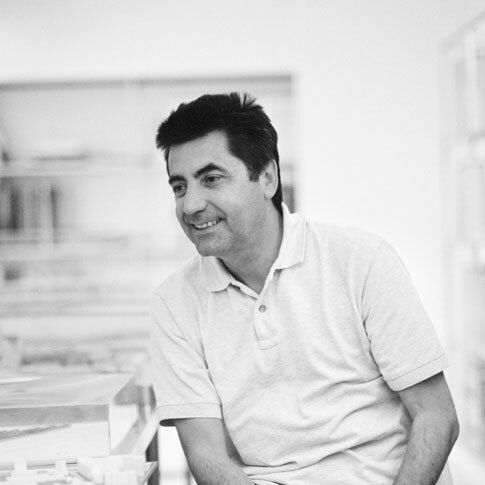 In 1999 Antonio Citterio and Partners was founded by Citterio and Patricia Viel, a multidisciplinary practice for architectural design, industrial design and graphics. In 2004, Citterio and Partners completed the inaugural Bulgari Hotel in Milan, the first of a chain of luxury hotels known as the Bulgari Hotels and Resorts. This was followed in 2006 by the Bulgari Resort in Bali, and in 2007 by the Bulgari restaurant and cafe opened in Tokyo's Ginza district. In 2007 he received the Royal Designer for Industry award from the Royal Society for the encouragement of Arts, Manufactures & Commerce in London.